Frogs are important part of pest control in the garden. This wire work frog will not do that for you but it will make you smile whenever you see him. 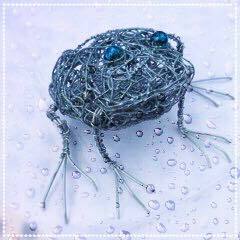 Carol Strerritt is going to come and tutor a half day workshop to make a cute 4 inch tall wire work frog. This workshop will suit anyone who like frogs or knows someone who does! Experience is not necessary but willingness to learn will help. Coffee and cake will be served to make the morning even more pleasurable.